Lawrence Teitel and Gary Dubro scored 3.94 masterpoints with a ★60.69%★ game at Bridge On Shea. See full results of this game. Bud Marsh and William Stollar scored 4.50 masterpoints with a ★65.38%★ game at Bridge On Shea. See full results of this game. Michael Flanagan and Bud Marsh scored 0.60 masterpoints with a 52.91% game at In Tempo Bridge Club. See full results of this game. Jack Shartsis and Marc Raphael scored 0.50 masterpoints with a 55.59% game at Bridge On Shea. See full results of this game. Gary Dubro and Lawrence Teitel scored 1.50 masterpoints with a 56.83% game at Bridge On Shea. See full results of this game. Jack Shartsis and Bud Marsh scored 2.55 masterpoints with a 59.29% game at Bridge On Shea. See full results of this game. 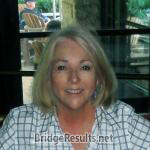 Jane Youngberg and Marc Raphael scored 0.84 masterpoints with a 56.25% game at Bridge On Shea. See full results of this game. Michael Flanagan and Bud Marsh scored 2.40 masterpoints with a ★61.31%★ game at In Tempo Bridge Club. See full results of this game. Jane Youngberg and Marc Raphael scored 0.43 masterpoints with a 52.03% game at Bridge On Shea. See full results of this game.